OWU’s Mini May Mooove Out, March 22, 2017! 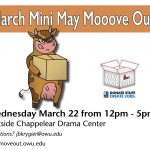 Bring your unwanted stuff and donate to Goodwill during our Mini May Mooove Out event on campus Wednesday, March 22 2017. OWU students and faculty have initiated an effort to offer sustainability themed quarter credit activity courses beginning in the 2nd module for the spring semester of 2017. 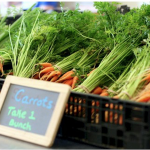 Experience a free, farm to table meal using many fresh, locally grown ingredients, Thursday February 16, 2017.